In the early 1950s, an eleven-year-old boy in Colombo boards a ship bound for England. At mealtimes he is seated at the cat's table as far from the Captain's Table as can be with a ragtag group of insignificant adults and two other boys, Cassius and Ramadhin. As the ship makes its way across the Indian Ocean, through the Suez Canal, into the Mediterranean, the boys tumble from one adventure to another, bursting all over the place like freed mercury. But there are other diversions as well: one man talks with them about jazz and women, another opens the door to the world of literature. The narrator's elusive, beautiful cousin Emily becomes his confidante, allowing him to see himself with a distant eye for the first time, and to feel the first stirring of desire. Another Cat's Table denizen, the shadowy Miss Lasqueti, is perhaps more than what she seems. And very late every night, the boys spy on a shackled prisoner, his crime and his fate a galvanizing mystery that will haunt them forever. As the narrative moves between the decks and holds of the ship and the boy's adult years, it tells a spellbinding story by turns poignant and electrifying about the magical, often forbidden, discoveries of childhood and a lifelong journey that begins unexpectedly with a spectacular sea voyage. Michael Ondaatje is the author of five previous novels, a memoir, a nonfiction book on film, and several books of poetry. "The English Patient" won the Booker Prize; "Anil s Ghost "won the Irish Times International Fiction Prize, the Giller Prize, and the Prix Medicis. Born in Sri Lanka, Michael Ondaatje now lives in Toronto. 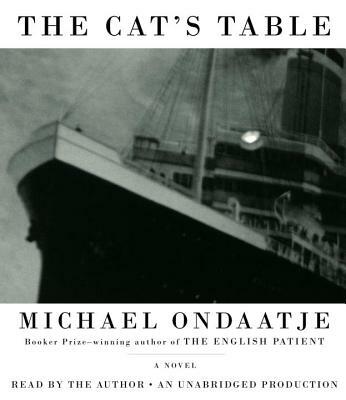 www.michaelondaatje.com "From the Hardcover edition.""